Kidzworld saw Ferdinand about a friendly bull who would rather sniff flowers than fight matadors. 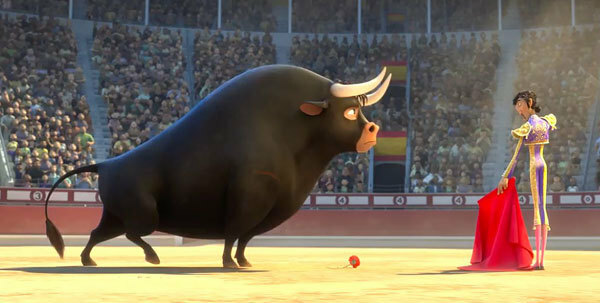 Does the movie have something to say about bullfighting? Check our review to find out more. 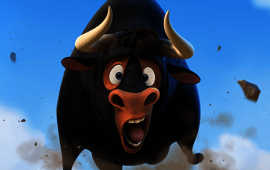 Ferdinand (voice of John Cena) is a sweet-natured young bull who escapes from a training ranch in rural Spain after his father never returns from a showdown with a matador. Adopted by a girl who lives on a farm, Ferdinand's peaceful existence comes crashing down when the authorities return him to his former captors. 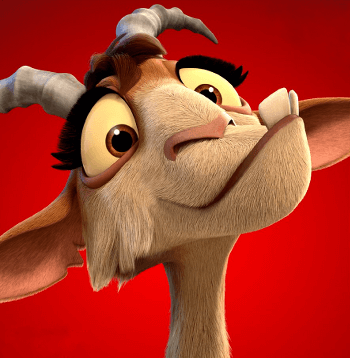 With help from a wisecracking goat and three hedgehogs, the giant but gentle Ferdinand must find a way to escape again with his friends and avoid facing El Primero (Miguel Andre Silvestre), the famous bullfighter who always wins. In Spain, a bullfight training ranch called Casa del Toro is home to a shy, flower-sniffing calf named Ferdinand who never wants to be a fighting bull and is teased by his fellow calves. When his brave dad doesn’t return from a bullfight, sad Ferdinand runs away and is adopted by Juan (Juanes) and daughter Nina (Lily Day) who run a flower farm. 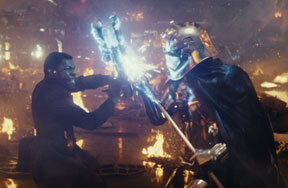 He becomes a pet even though they have a sheepdog named Paco (Jerrod Carmichael) who is a bit jealous. Still non-violent Ferdinand grows up into a handsome and humungous bull who is used to going each year to the local flower festival with his owners but is left behind when Juan realizes that he is just too big and will certainly be noticed. Ferdinand wants to help so he goes anyway on his own only to, unintentionally, wreck the festival and most of the town. Thinking he’s a killer “beast”, the locals have him carted away back to Casa del Toro! Ferdinand is reunited with the now grown bulls from his past; nervous Guapo (Peyton Manning), cruel Valiente (Bobby Cannavale), funny Bones (Anthony Anderson), a new Scottish bull named Angus (David Tennant) who can’t see much because his hair is over his eyes and one named Maquina (Tim Nordquist) who is…weird. 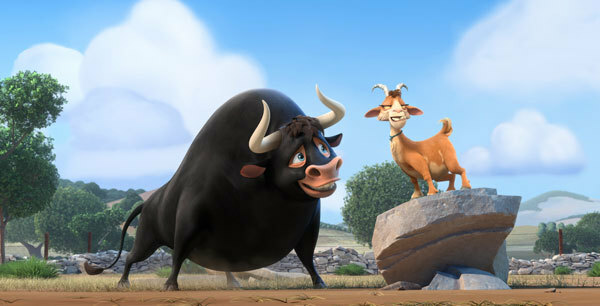 Ferdinand is scared so he is paired with a “calming goat” named Lupe (Kate McKinnon) who really wants to be a bull trainer. He also meets thieving hedgehogs Una (Gina Rodriguez), Dos (Daveed Diggs) and Cuatro (Gabriel Iglesias)…. Don’t ask what happened to Tres. Famous bullfighter El Primero comes to Casa del Toro to pick the best bull for his last fight so he can retire. Guapo fails to impress and is taken to “the chop shop” (we know it’s a slaughterhouse). Freaked, Ferdinand tries to convince the others that win or lose, you don’t survive. He has found his own father’s picture and horns mounted on a plaque placed on the ranch owner’s wall along with scores of others. Valiente convinces the others that they are stuck with their fight or die life. 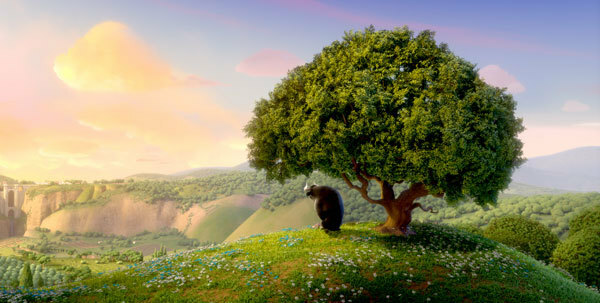 Even though the hedgehogs and Lupe help him escape, Ferdinand comes back to help free his friends. He ends up butting heads with Valiente and breaking off one of Valiente’s horns. Deemed useless now, Valiente is sent to the chop shop too! Having seen Ferdinand accidentally knock off Valiente’s horn, El Primero chooses him as the best and last bull he will fight. 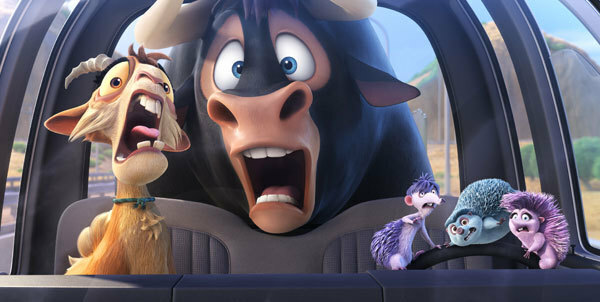 Finally Ferdinand convinces the other bulls along with Lupe and the hedgehogs to make a crazy escape in a van (yes hedgehogs can drive). Will Ferdinand free his friends at the chop shop before it’s too late? Will he end up fighting El Primero? Will he ever make it back home to the flower farm? What is the fate of his friends? The basic story of Ferdinand, the flower-loving bull, has been around since the 1930’s. It started with Munro Leaf’s classic children’s book about a bull who values friendship and kindness over violence and fights. The story is full of cool messages like “don’t judge a book (bull?) by its cover” and friendship among very different creatures is possible, violence isn’t a great way to solve problems, etc. 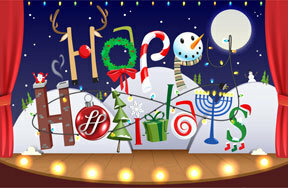 All voice actors do a great job. 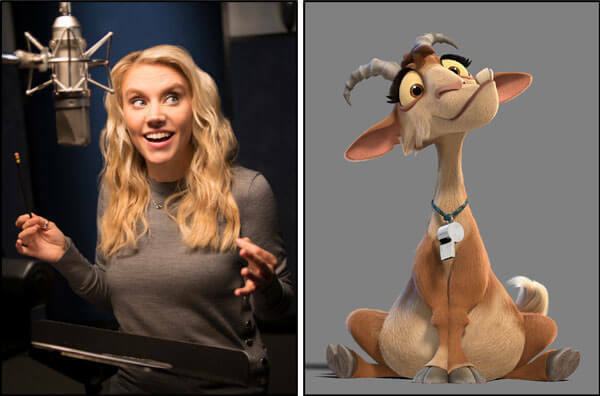 The wonderful SNL star Kate McKinnon is a hoot as wacky, wuvable goat Lupe and ex-wrestling champ turned actor John Cena conveys sweetness and also strength as Ferdinand. A problem might be a trip through a slaughterhouse to save two bulls. Yes, you don’t see any blood or gore but seeing the machinery itself kind of upset me. Maybe the younger kids won’t “get” it however and just think it’s a fun rescue. I was glad to see that the cruel “sport” of bullfighting isn’t glorified (I think it should be outlawed) although it isn’t strongly condemned either. Despite a few sad moments, there is plenty of warmth and visually cute and fun jokes…Ferdinand is literally a bull in a china shop at one point and the whole gang participates in a dance off versus the fancy Lipizzan performing horses who live next to the ranch. Really fun to watch. 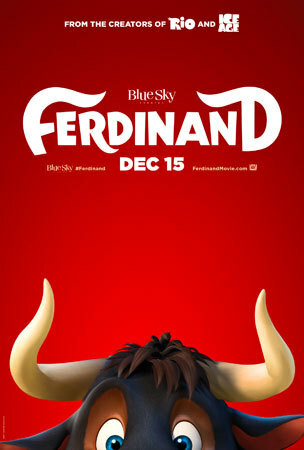 Although I have a few mixed feelings about some of the subject matter, Ferdinand is warm-hearted, classic story and is charming and well-produced enough to please the whole family this holiday season. Hey, how many times can you see Star Wars anyway? Give this film a try. We can go four stars. 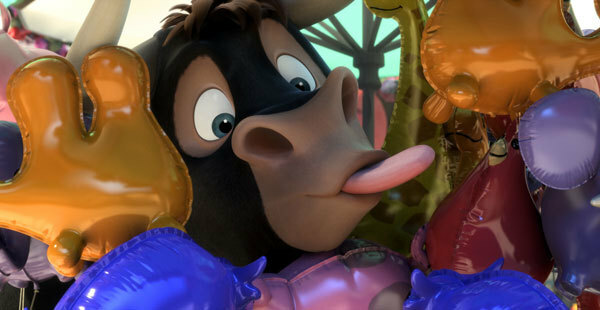 See Ferdinand in theaters now! Do you think bullfighting is cruel to animals? Are you familiar with the story of Ferdinand the friendly, flower-sniffing bull? Comment below! Would You Run With the Bulls?